Karen Benjamin was pronounced dead from injuries she sustained in a hit-and-run last month. 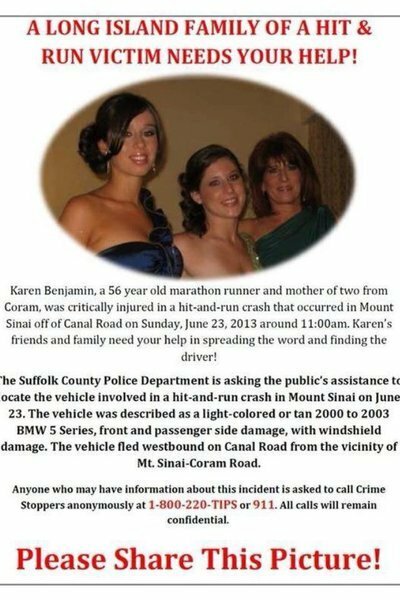 Last month Karen Benjamin, 56, of Coram, was jogging on Canal Road in Mount Sinai a little before noon when she was struck by a vehicle who sped away from the scene. Benjamin was pronounced dead yesterday from the injuries she sustained on the June 23 hit-and-run two miles from her home. Police were unable to immediately identify Benjamin at the scene because she wasn't carrying identification during her morning jog. The driver left her lying there on the side of the road critically injured. She was thrown into a guardrail so hard she almost lost both her legs and doctors at Stony Brook performed brain surgery in an attempt to save Benjamin's life. "I just don't understand why someone would do this and not stop," her daughter Lindsay Benjamin said in an interview with ABC. "Just stop.” Benjamin was a mother of two. You can leave your condolences to the family of Karen Benjamin by clicking here on the Facebook group made in her memory. Suffolk County Police Department detectives are looking for help from anyone with information on the car and driver involved in the incident. They're saying to be on the lookout for a tan or light-colored 2000 to 2003 BMW sedan or station wagon. Anyone who flees the scene of a crime or accident in New York State faces up to 15 years in prison. All calls to crime stoppers are left confidential at (800) 220-TIPS. Subject: LongIsland.com - Your Name sent you Article details of "Woman from June 23 Hit-And-Run in Mount Sinai Pronounced Dead"